Hughes Spalding hospital is located in downtown Atlanta near Edgewood Avenue and Grady Memorial Hospital. This facility offers many services including an Emergency Department open 24 hours a day. Children’s provides appointment-based primary and specialty care for concerns of the teenage years, including development, puberty, contraception and eating disorders. We serve children ages 13 to 18. Tuesday, 5 p.m. to 8 p.m.
Friday, 1 p.m. to 5 p.m.
Children's provides appointment-based care for children and teens with allergic conditions requiring assessment and management. Children's provides appointment-based care for children and teens with complex, hard-to-control asthma. The Aflac Cancer and Blood Disorders Center provides appointment-based care for children and teens (ages 0 to 18) with sickle cell disease and other blood disorders. At Children's, our team of pediatric specialists work together to provide comprehensive, ongoing care to children who have cerebral palsy. The Center for Safe and Healthy Children is a child advocacy center that provides medical examinations for children and teenagers who have symptoms or behaviors of suspected physical or sexual abuse. At Children’s, our specialists know how diabetes can affect kids’ bodies. They also know how to put kids and families at ease—and how to encourage preventive care and self-management to prevent complications. Our Emergency Department serves children of all ages, and is open 24 hours a day, seven days a week. No appointments are needed. We treat serious or life-threatening illnesses, injuries and conditions. The Children's endocrinology team provides clinical, diagnostic and lab services for the evaluation and treatment of diabetes and other endocrine disorders. 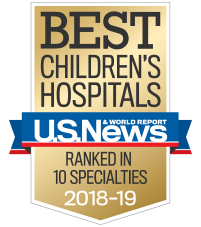 At Children’s Physician Group, our neurologists treat disorders of the nervous system including conditions of the brain, spinal cord, nerves and muscles. Serving as the medical home for children ages 0 to 18, we provide appointment-based well care, including check-up visits and immunizations. We also offer care to address long-term medical problems and acute illnesses such as ear infections, strep throat and asthma. Monday, Tuesday and Thursday 5 p.m. to 8 p.m.
First and third Saturday each month, 8 a.m. to 12 p.m.
Children's provides appointment-based care for children with complex, hard-to-control asthma and for children with allergic conditions requiring assessment and management. Fluoroscopy: Monday to Friday - 9 a.m. to 12:30 p.m.
Ultrasound: Monday to Friday - 9:30 a.m. to 1:30 p.m. and 2:00 to 10:30 p.m.